Other than EOS and Tron which are still oscillating in the green territory, most coins are correcting and for good reasons. 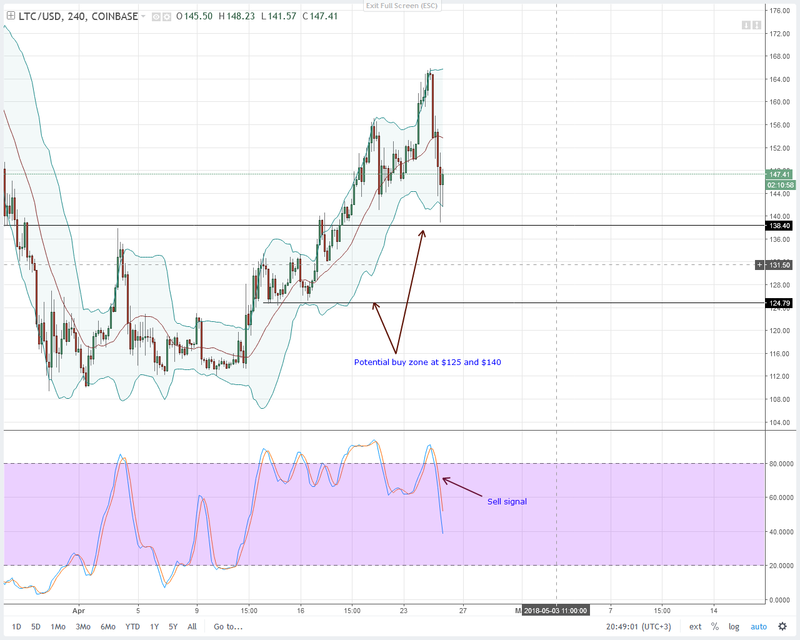 Leading the correction pack is IOTA which is down 14 percent and NEO which follows closely at 12 percent. It’s my expectation that sellers shall confirm the double bar bear reversal patterns that is clear in the daily chart as they move lower and probably rest and reverse at our support lines. Because of this, I’m net bearish but with a bullish skew. When it pops it does pop and Stellar is no exception. After periods of consolidation and liquidation in the 4HR chart, sellers found their way. In the daily chart we now have this nice double bar bear reversal pattern complete with a stochastics sell signal forming in the midst of an uptrend. In my view, this short term correction is a blessing in disguise for those who want to add their longs and for those who missed the original rally up. As before, the entry chart is the 4HR chart and here, price action is in sync with the daily chart. I expect buyers to find support anywhere between 25 cents and 30 cents. 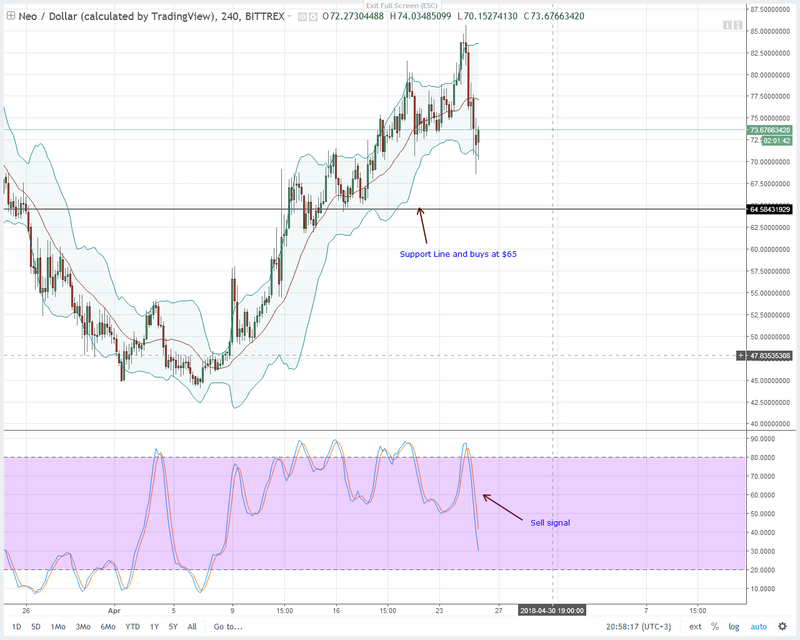 If a stochastic buy signal prints at this zone, buyers should initiate longs and aim for 50 cents and 70 cents as per our previous Stellar Lumens price forecast. In the last 24 hours, IOTA prices have been on the receiving end of bears. It’s down 14 percent for the day and has fallen gracefully from its peak at $2 where it had perched. Like most coins, this is just but a normal correction and buyers can now ramp up at a discount. 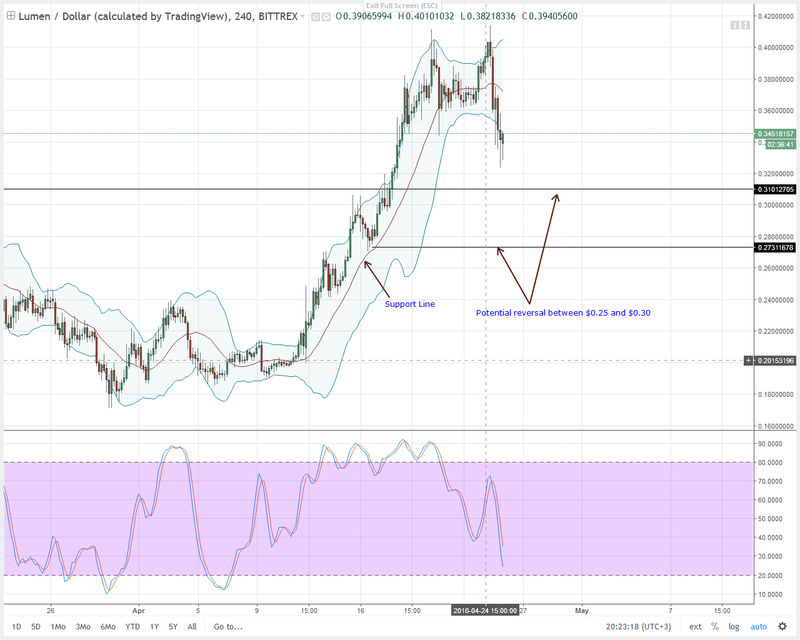 In my view, sellers can continue loading up shorts in lower time frames now that there is a stochastic sell signal in our entry chart and most importantly in the daily chart where a double bar bear reversal pattern is visible. Going forward, potential support lies anywhere between $1.5 and $1.7. 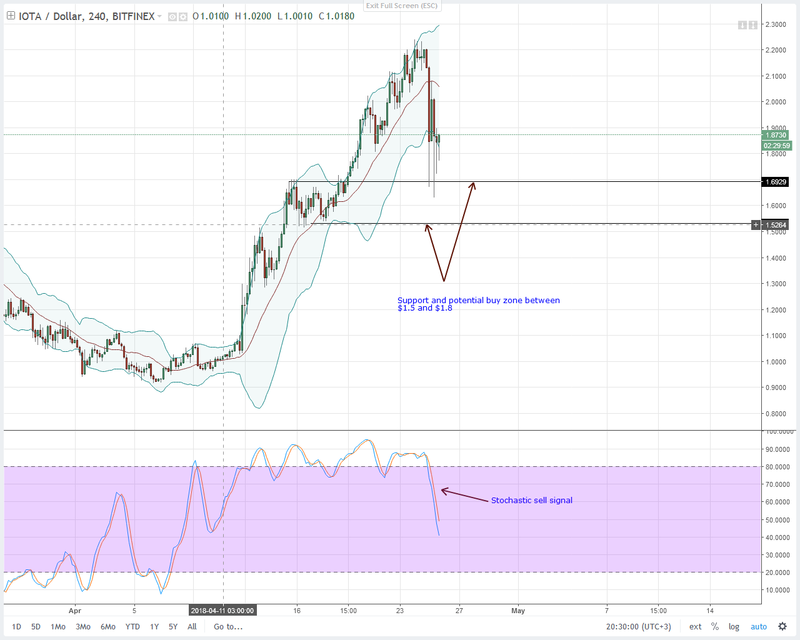 At this zone, hints of buy pressure or a stochastic buy signal should provide possible of higher highs and possible IOTA propulsion towards $3. Whether EOS will smash January 2018 highs today or in June doesn’t matter. What we do know is that price appreciation in the run up of EOSIO launch which is less than 40 days away is inevitable. After all, EOS has been doing a pretty good job when it comes to marketing their product, so demand is something that shouldn’t be a problem. After a 110 percent surge in the last 30 days and a 50 percent spike on April 24, yesterday’s price action is what we were anticipating. Our EOS trade plan is simple. From our technical set up, any depreciation towards $12 is positive since buyers can own EOS at a discount. Then again, we have a stochastic sell signal in the 4HR chart complete with an over-extension following that 50 percent flash gain on April 24. I remain neutral but I’m leaning towards bulls. Ideally if prices drop towards the upper end of our support at $11.5 or anywhere in between that level and $9.5 on the lower end then I shall be watching out for reversal signs. 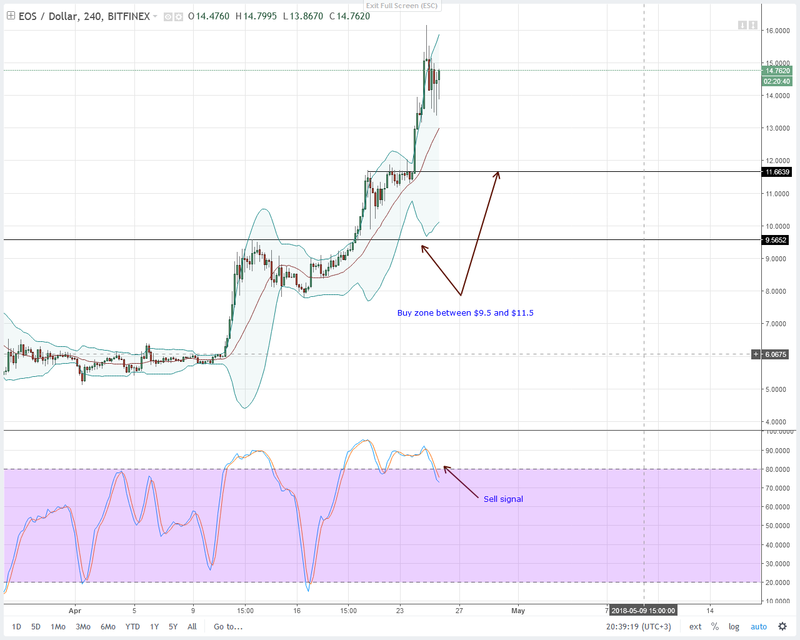 If not and prices surge past $17, then we can project EOS at $25 in the coming weeks. After all, buying and syncing with the weekly trend is a sure way of registering a profit. Besides the 10 percent drop in Litecoin prices in the last 24 hours, it’s now official that Wirex is adding Litecoin to their wallet. Going forward, all verified users can trade or transact using Litecoin as a settlement. This is actually good news if we are banking Litecoin retail demand to drive prices up. Technically, sellers are in the driving seat and capitalizing that bearish divergence pattern that has been panning out for the better part of last week. I will reiterate and say that there is a Litecoin undervaluation with the coin trading within a break out pattern. In my view, we expect first support at $140 and if sellers slice through this level effortlessly then we expect support anywhere between $125 and $140. This $15 zone is our ideal level of buying whenever a stochastic buy signal prints in the 4HR chart. 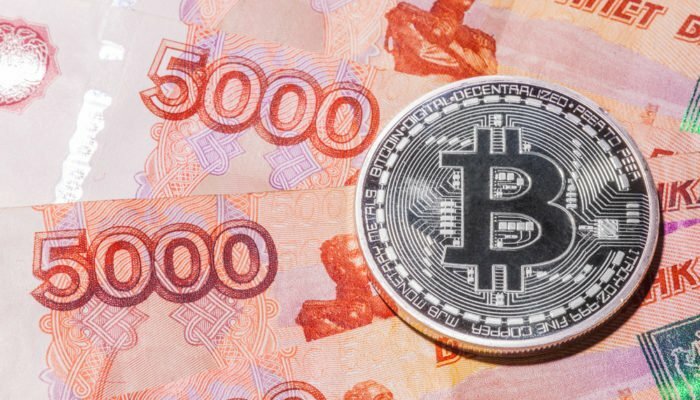 Of all the coins in the top 10, NEO is resilient and it has been even during the necrotic bear market in Q1 2018. Now, NEO, through its investment arm the NEO Global Capital shall inject $1 Million into Moonlight. Moonlight is a project that will launch on NEO and plans to change how recruitment of human resource is done. From the chart, NEO is correcting just like its peers. It’s up four percent for the week and down 12 percent in the last 24 hours. Ideally, buyers might find support at $60 or there about before rebounding and probably rallying towards $90. As it is, we have a stochastic sell signal in place and until when there is a shift of momentum, buyers should stay neutral.